There’s a good reason that most virtual reality is designed to be played while seated. 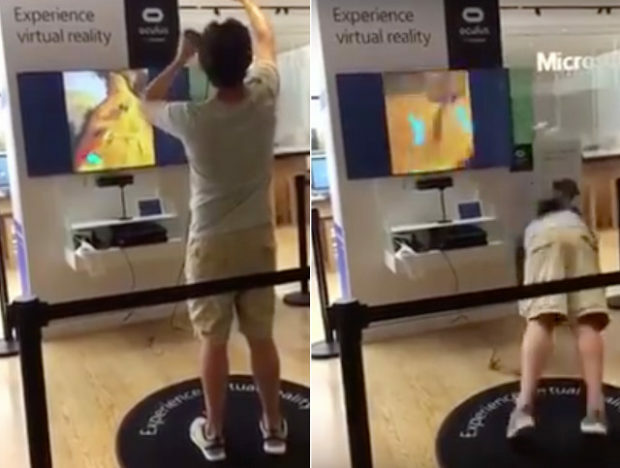 Check out this video of some guy demoing the virtual reality rock climbing game The Climb for the Oculus Rift. It’s probably a lot of fun if you aren’t faceplanting super hard. It’s a good thing that Oculus Rift headset was on his face to break his fall a little bit. I wonder if it left an impression on what was left of his face after he took it off. That’s gotta be embarrassing. The woman helping him up is trying very hard not to laugh. This is not how you climb rocks, in or out of VR.